GEORGE TOWN: SP Setia Bhd plans to launch four new residential projects with an estimated gross sales value RM546mil on the island beginning this December and next year. SP Setia property (North) general manager S. Rajoo told StarBiz that the projects comprised the RM175mil Setia Greens, RM60.5mil Brook Residences, RM170mil Setia V Residences, and the RM139mil Pearl Villas in the Setia Pearl Island scheme. Setia Greens, comprising 149 three-storey terraces and 18 semi-detached houses with dual frontage in Sungai Ara, would be launched in December. “The selling price starts from RM918,000 onwards for terraced units with built-up areas ranging from 2,400sq ft and 3,200sq ft.
“The selling price for the semi-detached units, with built-up areas of around 3,300sq ft, is around RM1.6mil onwards,” he said. Subsequently the group would launch Brook Residences in February 2011 and the Pearl Villas in April, and Setia V Residences in the second half of next year, Rajoo said. “The Brook Residences in Brook Road, a prime residential area near Jesselton Road, comprises 11 luxurious bungalows priced from RM5.8mil onwards, while the Pearl Villas comprise 35 bungalows priced from RM2.8mil onwards. “The Setia V Residences project in Kelawei near Gurney Drive, comprising 67 luxurious condominiums, tentatively priced from RM2.8mil onwards,” he said. Rajoo said Setia Greens would be the northern region’s first Green Building Index-rated project. “What makes the project unique are the environmental features such as solar water heater, rain-water harvesting system, water efficient fittings, and cool roof system for each unit. “We are using a special low-volatile organic compound paint for the project,” he said. Rajoo said these new projects were targeted at the executives working in the south-west district of the island as well as investors. For the nine months of SP Setia’s fiscal year ended July 31, 2010, the group’s projects from Penang contributed close to RM150mil or about 10% of the RM1.95bil revenue posted for the nine month period. “We are confident that the contribution from Penang this fiscal year closing Oct 31, 2010 will hit over 10% of the targeted RM2bil revenue of the group. “Setia Vista, Reflections condominium, and the new semi-detached launches in Setia Pearl Island contributed significantly from Penang,” he said. Rajoo said Penang would continue to play an important revenue generating role in the group’s property development business. “We will continue to look for land in prime locations either to develop on our own or on a joint-venture basis,” he added. Meanwhile, Henry Butcher (Malaysia) Penang director Dr Teoh Poh Huat said high-end properties were still sustainable in Penang, as there were now overseas Malaysians investing in the island’s property market. “These are overseas Malaysians earning pounds and US dollars, who are buying high-end properties with the view to come home to stay one day. “This segment is playing an increasingly important role in the Penang high-end property market developed by branded developers,” he said. NAZA TTDI's Dualis Business Centre units in Seri Kembangan were snapped up barely two hours after its launch over the weekend. The 32 units of two and two-and-a-half storey semi-detached shop offices are located within the prime residential and commercial area of Equine Park. They are part of an 8.7 acre mixed development which will also include other components that will be announced and launched at a later date. Naza TTDI's group managing director, SM Faliq SM Nasimuddin who was present at the launch said, he was encouraged by the response for the shop offices and assured purchasers that apart from living to the company's tagline of delivering the project ahead of schedule, quality will not be compromised. He said TTDI Dualis Business Centre will be a new lifestyle hub in the area with its modern architecture concept and open space. The development is an ideal location for offices, banks, showrooms and F&B outlets, he added. Faliq expects the launch on Saturday to attract a lot interest from buyers with the project's well-planned layout, strategic location and alluring design. The two-storey shop office built-up starts from 3,472 sq ft with the land area from 2,866 sq ft with prices starting from RM1.5 million. 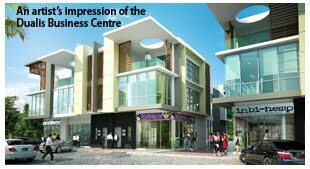 For the two and half storey shop offices, built-up starts from 4,733 sq ft with land area from 3,587 sq ft. Price for the two and a half storey shop offices starts from RM2 million. The project is expected to be completed in October 2013. GLOMAC Bhd is buying 18 units of apartment in Suria Stonor Condominium for RM38.41 million as an investment. It views the property as one with a potential for a quick turnaround, Glomac said. The purchase is at a discount of 35 per cent to the last transacted price of RM1,000 per sq ft for comparable properties at Suria Stonor. SHANGHAI: GuocoLand Ltd, which is a Singapore-listed property investment arm of Malaysian conglomerate Hong Leong Group, will hunt for other land in China after its setback in acquiring a plot in Shanghai. GuocoLand China Ltd group managing director Violet Lee said the company had allocated about 6.6 billion yuan (RM3.1bil) to increase its land bank but it only managed to secure one of the two plots it bidded in Shanghai. The successful bid is for a 47,647 sq m site in the Changfeng Ecological Business District in the Putuo district which was sold at the price of 3.04 billion yuan (RM1.4bil). “There will be leftover of funds and we will use them and continue to bid for other land,” she said after a signing ceremony in Beijing last week which saw the entry of the five-star Poly International Cinema into Beijing Guoson Mall. 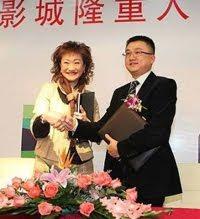 Violet Lee and Liu Debin at the signing ceremony in Beijing on Oct 20. To date, GuocoLand China has invested an estimated US$3bil (RM9.3bil) in China with an ever-growing land bank of two million square metres in Beijing, Shanghai, Nanjing and Tianjin. Beijing Guoson Mall, spanning 160,000 sq m, is located in GuocoLand China’s flagship project Guoson Centre which has a total area of 600,000 sq m. The mixed development project is smacked within Dongzhimen, which is regarded as Asia’s largest transportation hub with three subway and light rail lines, dozens bus routes and a daily traffic flow of 800,000 commuters. The similar development has been emulated in the Guoson Centre in Changfeng, Shanghai. The 500,000 sq m is located at the crossroads of the business zones of Zhongshan Park, Gubei and Hongqiao and only 10-minute drive from the Hongqiao transportation hub. It will also include a Guoson Mall, a Guoman Hotel and office and residential buildings. The newly-acquired land is situated in the same area as the Guoson Centre in Changfeng and will be used for residential development. In 1998, GuocoLand China developed its first commercial building called Corporate Square in Beijing’s Financial Street. Only in the last few years, the company entered Shanghai, Tianjin and Nanjing in a big way by building upscale condominiums. The company is considered a late bloomer in China’s real estate industry and is now up against heavyweights like CapitaLand, Keppel Land, Cheung Kong Holdings, Kerry Properties and Sun Hung Kai from Singapore and Hong Kong. However, GuocoLand China builds its name as the transportation hub specialist. “We had come to China many years ago but we were very low profile unlike others who used to boast about their presence,” Lee said. She said there were many successful approaches that the company could emulate from its projects in Singapore and Malaysia for China but it would prefer to build homes and commercial properties suited for the local market. “We have built many green buildings in many places. We want to showcase this in China and are proud to say that we have done quite a lot to green the Guoson Centre,” she said. With the signing of tenancy agreement between GuocoLand China and Poly Film Investment Ltd, Guoson Mall in Beijing will house one of the most advanced cineplexes in China. The cineplex will meet international standards of high-end and eco-friendly cineplex and occupy 7,000 sq m with nine screens and over 1,500 seats. Poly Film general manager Liu Debin said the Guoson Mall’s brand positioning and vision was in line with Poly Group’s aim of providing the best service. “Through its strategic location and well-built business atmosphere, we see enormous commercial value and potential. We are sure that our cooperation will lead to a win-win result,” he said. Lee said GuocoLand and Poly would establish a long-term partnership and look into further cooperation in other projects in China, especially the Guoson Centre Shanghai. She said being strategic partners would bring benefits to both companies as they could market themselves even better. “It’s a rare opportunity to develop such a huge project in this strategic location. We will do our best to fulfil our promise to bring our best development to Dongcheng district (where Guoson Centre Beijing is located) and do our part to improve the people’s lifestyle,” she said. Guoson Mall is scheduled to open early next year. The Guoson Centre project won the Asia Pacific International Property Awards (APIPA) 2010 for the Best Mixed Use Development in April. This is the first time a Chinese development won the prestigious award.